This first batch is pretty diverse! In the original stack, the picture on the top left was the first one I saw–and it’s one I don’t remember drawing! the eye style I used at that time was a very unique one, I think, but it only lasted for a little while. I drew in this style when I first started drawing Naruto OCs. It makes sense, then, that the two characters in that picture are both personas of me for Naruto. The second picture is, of course, Sasuke…though again I don’t really remember this picture. I think I recall drawing it, but I don’t remember the reason or meaning behind it. The next picture is an earlier one, probably from mid-seventh grade (2007?) which displays strange proportion but a nice pose. 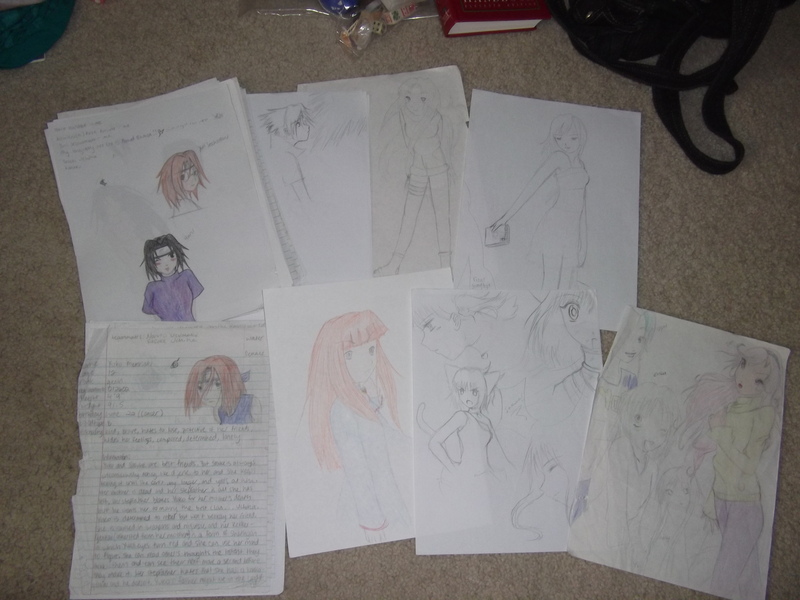 The last picture on that top row is a more recent (read: better) one, probably early 2008 (ninth grade). I had intended to enter it in a contest, but never did. I think I submitted something else…? 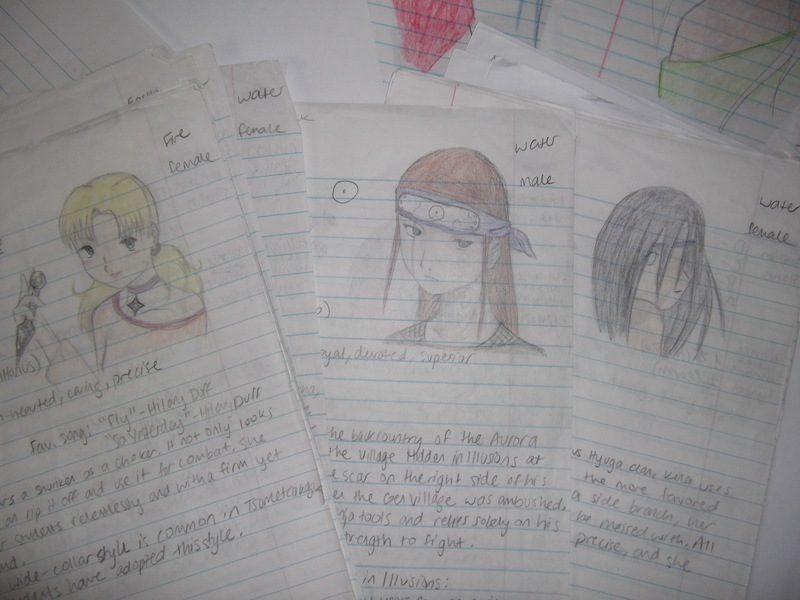 Second row, from left: a typical Naruto OC profile; this one is for Murasaki Yuko. One of the first pictures I submitted to deviantART was a picture with Yuko, Naruto, and Sasuke, so you can look for that in my gallery if you like. c: I read the profile, and…she really is a bit Sue-ish…though not entirely…not as much as my past-main Naruto OC, Kana…lol. The final picture is another “nowhere idea” based off of W.I.T.C.H.. It’s called H.O.P.E.S. and the fifth character is on the other side of the paper. I’d guess I did this in seventh grade, judging from lack of proper proportions. Below that you can see a form of some sort on the left. What is that? 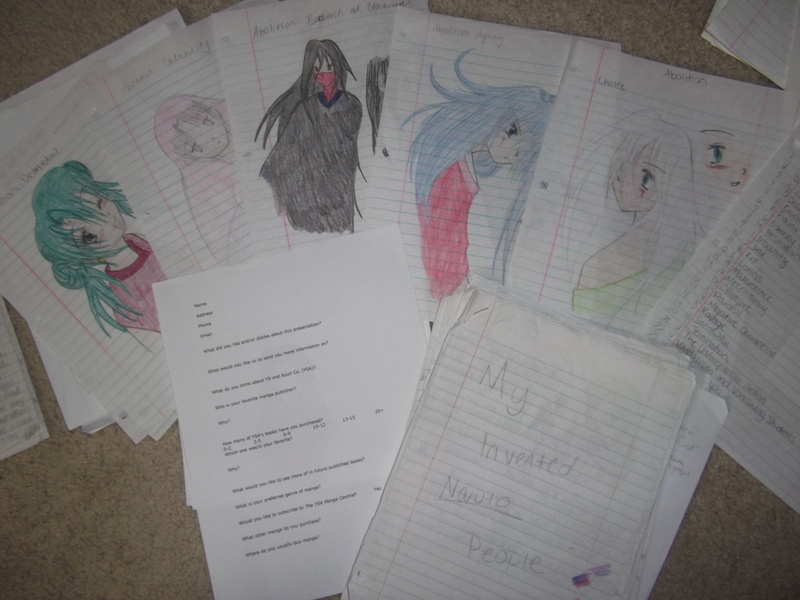 Well, my friend Azuri and I had planned to start our own publishing company after finishing school…so I made several documents that pertained to that. This questionnaire is one of them! I made tons of villages and countries, and that meant I needed tons of ninja.